As you surely know, a big part of selling a home is maintaining a high level of professionalism. 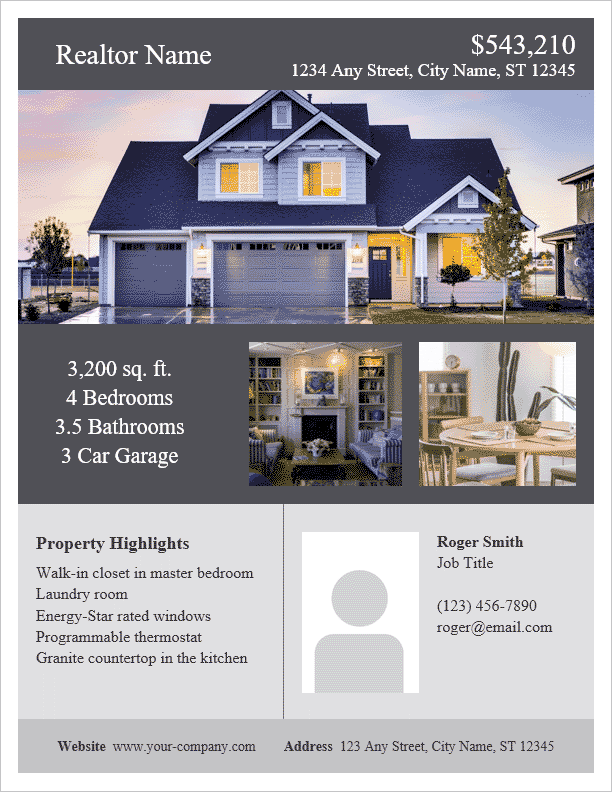 Having flyers that look professional is a great way to send your clients home after a viewing with something that will remind them of the highlights of the property. We've created two designs that each fit on an 8.5x11 page for easy printing at home or your local print shop. These flyers have been designed with Microsoft Word's themes in mind. Simply go to Design > Theme and choose from a variety of themes that will automatically change the fonts and colors. Select the image you want to replace and delete it. Go to the Insert tab and select Pictures. Find your image via the Insert Picture file browser window, then click the Insert button. IMPORTANT: With the newly inserted image selected, update the image's wrap text setting by clicking on the contextual Picture Tools / Format tab, then in the Arrange group click on Wrap Text and select Behind Text. Now you're free to move and resize the image so that it fits nicely in the space. Tip: If you find the image you're using is too tall or too wide, you can crop it by using the crop tool under the Picture Tools / Format tab in the Size area. Tip: Quickly get to the Wrap Text setting and Crop tool by right-clicking on the image. In the Design tab click on Themes. Hover the mouse over the themes to see a quick preview of what your flyer will look like. Click on the theme you like to update the template. Tip: Each theme uses its own font, and each font fills up the text areas differently. If the font is taking up more room than you'd like, simply change its font size. 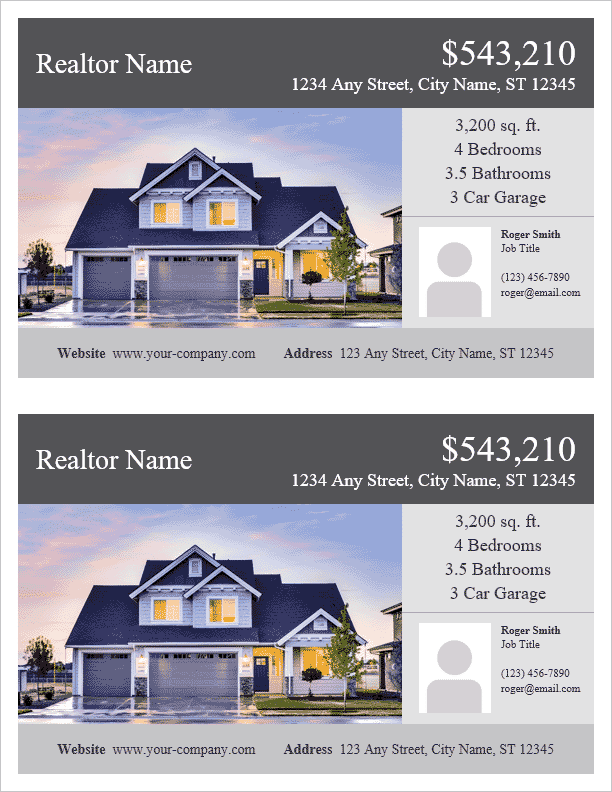 Printing Custom Flyers at VistaPrint.com - If you don't have your own color printer, or you want to ensure a professional print quality, consider using an online print shop. How to Become a Real Estate Agent at wikiHow.com - An in-depth look at the process of becoming a licensed professional in the real estate industry. 5 Tips For Becoming an Indispensable Real Estate Agent at Inman.com - A look at some general ways you can grow your brand as a real estate agent. Six Habits Of Successful Real Estate Agents at realtor.com - There's no better way to improve than to learn and follow the success of others in your field.